With Auston Matthews locked up through 2023-24, the Toronto Maple Leafs are turning their attention towards another pending restricted free agent – Kasperi Kapanen. TSN Hockey Insider Darren Dreger reported Thursday the Maple Leafs plan to open negotiations with Kapanen on a contract extension next week. "It’s believed that Kasperi Kapanen’s agent and Kyle Dubas of the Toronto Maple Leafs are going to engage in at least exploratory discussion next week," Dreger said on Insider Trading. "Talk about the possibility of a multi-year extension, what about a bridge deal if the player is even remotely interested in that. Just kind of get that dialogue going. What I know is that teams are curious on the trade front and the Toronto Maple Leafs, because of cap implications, know that Kasperi Kapanen could be also an offer sheet threat if it gets to that point in the summer." Kapanen, 22, has 18 goals and 36 points in 57 games with the Maple Leafs this season and is one of five pending free agents on the 23-man roster. Mitch Marner, the Maple Leafs leading scorer this season, is also set to become a restricted free agent in July, but has requested to put off negotiations until after the season. With Matthews signed for a cap hit of $11.634 million, the Maple Leafs currently project to have $12.89 million in cap space (with Nathan Horton's $5.3 million on long-term injured reserve) this summer if the cap stays flat at $79.5 million, per Cap Friendly. 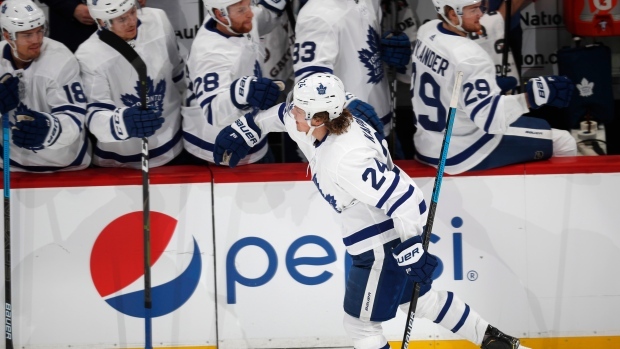 Andreas Johnsson, Igor Ozhiganov and Garret Sparks are also set to become restricted free agents, while Jake Gardiner, Ron Hainsey, Par Lindholm and Tyler Ennis are scheduled to hit unrestricted free agency in July. Kapanen, a first-round pick of the Pittsburgh Penguins in 2014, was acquired by the Maple Leafs in July 2015 as part of the return for Phil Kessel. He has 26 goals and 46 points in 112 games over his NHL career.